The forthcoming issue of Historical Archaeology includes a special thematic collection on “Intimate Archaeologies of WWII.” Dr. Jodi A. Barnes is the guest editor of this collection. She prepared the following comments to give you an overview of the collection. This new thematic collection resulted from a symposium on the intimate archaeologies of World War II at the 2015 SHA meetings in Seattle, WA. The papers focused on prisoner of war and internment camps as spaces in which private and personal encounters among people from different cultures and backgrounds occurred and the ways intimate interactions were surveilled, controlled, and manipulated and the internees’ responses to it. Not all of the papers from that symposium are included and the collection took on a new twist by considering the intimate information that is revealed by working with communities in the practice of archaeology. In two case studies, survivors, people who once lived at the sites under study, and descendants speak for themselves making intimate connections that problematize and energize the archaeology of these sites and highlight the importance of researching the dark history of World War II. The essays focus on three sites in the United States – Amache Internment Camp in Colorado, Kooskia Internment Camp in Idaho, and Camp Monticello in Arkansas. The commentaries by Stacey L. Camp and Harold Mytum bring the volume together. For more than 60 years, many of the sites were largely, sometimes willfully, forgotten, but they are increasingly becoming “heritage sites,” because preserving these places and telling their stories could, as National Park Service Director Jonathan B. Jarvis notes, “prevent our nation from forgetting or repeating a shameful episode in its past.” This reminder is necessary with ongoing confinement of immigrants in detention centers and discussions of wall building. These essays are a call to remember the places that remind us of the shame of imprisoning people because of their identity. Conversely, the authors, and the stories they tell about internment sites, remind us of the human potential to speak out, work together, and create change. 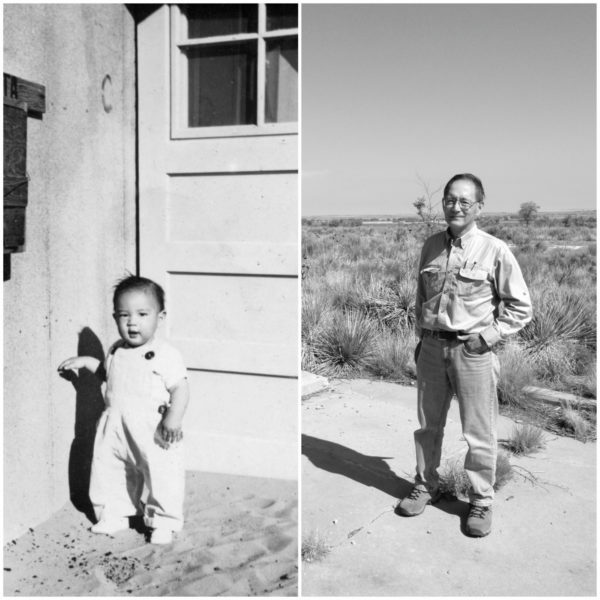 Photos: Dennis K. Fujita revisits Amache, the Japanese American Internment site where he was interned as a child, and discusses his experience of working with archeologists in this volume.